The Windows Autorun for external drive feature is an ability to auto launch programs when you enter to your external drive in Windows Explorer. Initially, the mechanism of Autorun was invented for the CD-ROM drive so that legitimate software supplied on CD-ROMs to be launch automatically when you insert CD-ROM to your computer or enter onto it with Windows Explorer. When a new kind of media: flash drives and external USB\SATA hard drives became widespread the developers of Windows “in a hurry” have transfered that feature to them, but they haven’t thought about possible problems. Unlike a CD a legal file autorun.inf can be easily changed by malware. 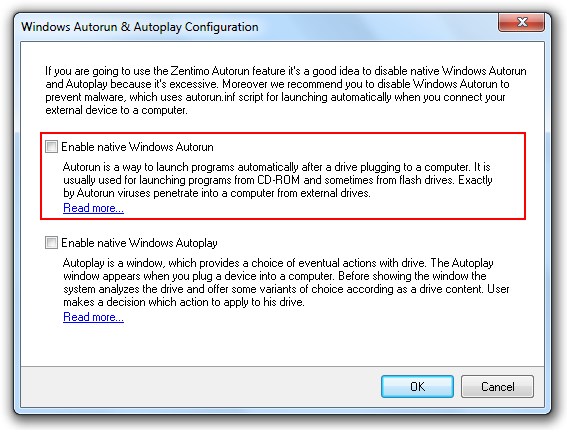 Microsoft Windows users often confuse Autoplay and Autorun. Unfortunately not only users, even MS Windows developers confuse these two different concepts in their documentation. Autorun is the feature to launch programs when you open the drive in Windows Explorer, whilst Autoplay is a window, which Windows shows when you connect an external drive to a computer. Actually, autorun-viruses and other malware spread using exactly Autorun feature. More information about this type of virus you can find in this article: What are autorun-viruses? Windows XP is the most suffered OS from autorun viruses since this feature is enabled by default there (e.g. Vista gives the user a warning message about trying to autorun and in autorun is completely disabled in Windows 7). 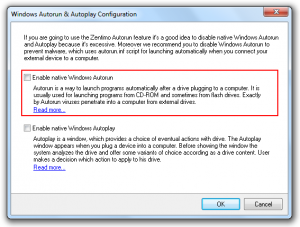 To disable Autorun you can use “Windows Autorun & Autoplay Configuration” feature.